A visitor’s perspective might be a touch, I don’t know, brighter. As one-half of a pseudonymous mystery-writing duo hailing from New York, but with California dreams, I am naturally drawn to Brooklyn-born cousins Frederic Dannay and Manfred Lee, who wrote under the name and created the character of Ellery Queen. 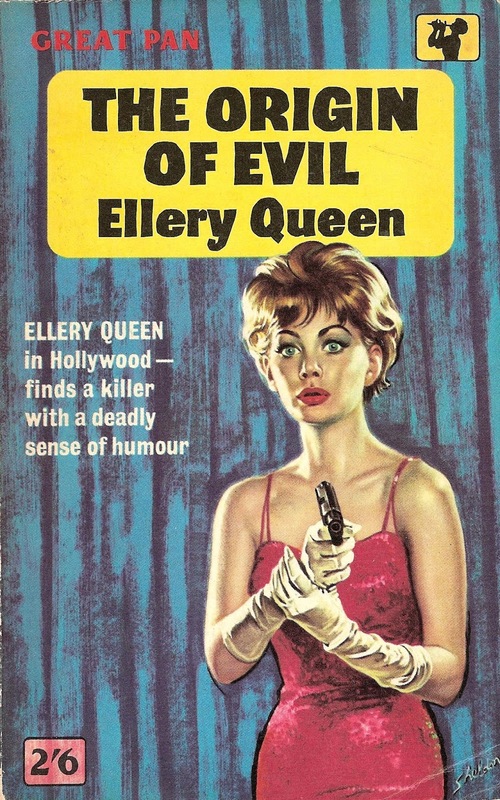 The Origin of Evil (1951) did not mark Ellery’s first Tinseltown foray in any sense. The mystery novelist turned occasional sleuth had by this point been the focus of a radio series, a TV show, and several films. The character had ventured west to try his hand as a screenwriter in the 1938 books The Devil to Pay and The Four of Hearts. Ellery simply wants to work, but then “every time he came to Hollywood something fantastic happened.” This trip will be no exception. His solitude is interrupted by Laurel Hill—“Probably Miss Universe of Pasadena,” he thinks sulkily of his young neighbor’s good looks—with a story he can’t resist. Her father, Leander Hill, died of a massive heart attack after receiving the unwanted gift of a dead dog. Hill’s partner in the jewelry business also received an anonymous warning, but refuses to divulge its nature. Ellery is initially dismissive. After all, “Hollywood was a playful place. People produced practical jokes on the colossal scale. A dead dog was nothing compared with some of the elaborations of record. One he knew of personally involved a racehorse in a bathroom, another the employment for two days of seventy-six extras.” But when a search of the Hill home turns up the note that accompanied the canine’s corpse, one hinting at a great crime committed years ago that has spawned a decades-long thirst for vengeance, Ellery sets his manuscript aside and starts investigating. Cryptic offerings pile up at the home of Hill’s partner, the wheelchair-bound tyrant Roger Priam, but he angrily rejects Ellery’s offers of assistance. Priam’s family keeps Ellery close, specifically his seductress spouse, Delia, whose charms weaken even Ellery’s resolve, and stepson Crowe Macgowan, currently living as a modern-day jungle man in a tree house in the hills while he awaits the inevitable collapse of society. “I’m the only realist I know,” Crowe claims, and he may not be wrong given that the Korean conflict erupts in the middle of this book. Dannay and Lee relish the texture of mid-century Los Angeles life. The maverick used-car dealer “Madman” Muntz has taken to the skies over the city, a pin-up girl is crowned “Miss National Casket Week,” and Ellery must remind himself that “in Hollywood dress is a matter of free enterprise … at least one man dressed in nothing but Waikiki trunks may be found poking sullenly among the avocados at any vegetable stand.” The extravagantly extended Priam clan itself is a singular Southland phenomenon; “Hollywood had always attracted its disproportionate quota of variants from the norm,” Dannay and Lee write, enumerating how Roger and his kin could never truly flourish in Seattle or Vandalia, Illinois. But it is the eventual revelation of the killer’s identity, motive, and strategy that demands the broad canvas only the City of Angels can provide. “The pattern is fantastic,” Ellery declares once he tumbles to the truth, fearing that his L.A. Police Department ally “still suspects what Hollywood calls a weenie,” the term coined by actress and stuntwoman Pearl White (The Perils of Pauline) that prefigured Alfred Hitchcock’s fabled MacGuffin. The grandiosity of both characters and scheme sent tremors through the Dannay/Lee partnership. By this stage of their collaboration they had become famous for fabulously ornate plots sold through skilled prose; the twists and turns of their undisputed masterwork Cat of Many Tails (1949) have lost none of their diabolical power. 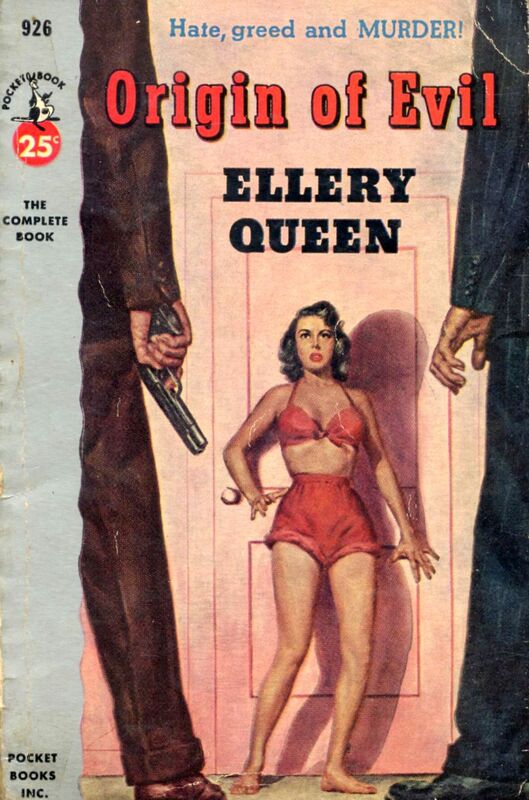 In a January 23, 1950, missive collected by Joseph Goodrich in his book Blood Relations: The Selected Letters of Ellery Queen 1947-1950, Lee praises the Origin of Evil denouement presented in Dannay’s outline: “It is a great concept, bold, original, ‘big’—as a mystery idea well deserving the nomination for ‘classic.’” But he frets about filling in the psychology that would shore up this tale’s Byzantine plot, a task compounded by the “exaggerated, distorted picture of Hollywood” painted by the outsize Priams. The cousins set aside their differences and produced a book that, if not quite a milestone, remains a marvel. Clues are literally studded everywhere in The Origin of Evil; to cite even one example would spoil the fun. Preposterous and endlessly inventive, it is not a show-business novel but one that could only play out in Hollywood.